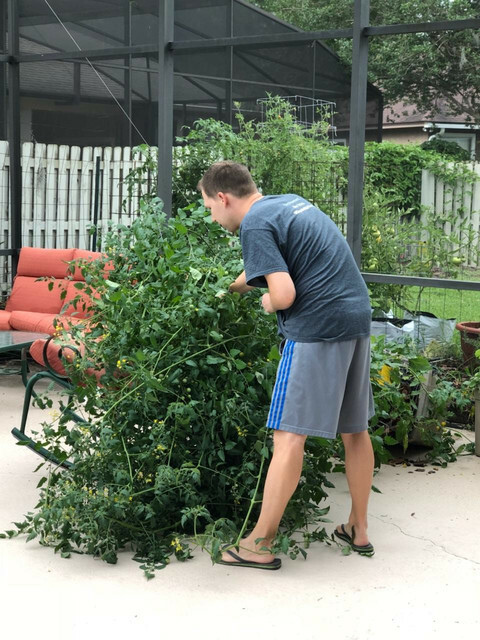 Tomatoville® Gardening Forums Index > We're Here For The Tomatoes!™ > Growing In Containers > What size/varieties do you grow in an *EarthBox?" What size/varieties do you grow in an *EarthBox?" I'm growing more and more of my plants in containers -- mostly EarthBoxes. I find that most determinates and all dwarfs work great in an EB. even some smaller IND varieties. But I have not grown big cherry tomato plants that way, yet. I don't use an auto watering system, so that means I have to go out every morning and fill the reservoirs. But still, I'd like to get all of my plants in EB's, starting maybe next year or the year after. If you have grown big cherry plants this way, how has it worked out for you? One plant or two? Do you have to really prune them to keep them under control? Sweet Baby Girl would probably be a good candidate since it is a reduced size IND plant. But no longer in production, I've read. Esterina is a really good variety that we love, but it gets really big. Sunchocola? Maybe Maglia Rosa (but it is determinate/semi.). Maybe you know of some others? Last edited by Greatgardens; May 27, 2018 at 04:32 AM. I have and do grow everything in EBs including large cherries. 2 plants per box. Works out great. My EB tomatoes are AWESOME, thanks Marsha for all of your advice! That was a day brightener, and you are welcome. Do you prune extensively, and do you have to water more than once per day? I only prune by pinching off the suckers that are below the first flower truss, and a leaf here and there for better airflow. I only water once every 3 days, or at the most, every other. You have a 3 gallon water reservoir in the base. I added water every day the first year, and they were more watery tasting. Don't forget, I grow when the daily high is 70s to low 80s. We cannot grow in the summer here. I would say learn how often you need to water, by watching for the first sign of wilting. Tomatoes will easily bounce back from a slight wilt done once. Thanks for the watering tip; I didn't know that. I've been watering daily all this time. Days like today (wind/rain) I won't water at all but starting next season I will go every other day. Even if the reservoir is dry, the mix will still be moist like a container. I also grow any size tomatoes in the EB's. Staking was always my biggest problem; never the plant size. Late this spring I started adding extenders to the EB with younger/smaller plants. I mostly grow dwarfs, and this year some small indeterminates (Rosella Purple, Awesome, Sneaky Sauce, Maglia Rosa Cherry Tomato, Marzano Fire Paste Tomato, Secret Sauce (short), Dark Queen, Pink Berkeley Tie-Dye) . Would love to try Sungold and Pineapple, which I used to grow in the ground, but they grew 8 feet tall! I am open to trying again. Last edited by Shrinkrap; May 27, 2018 at 06:49 PM. ..."We cannot grow in the summer here." I've read that before, but don't really know why it is that way. Just too hot (at night) or? Thanks for the info from all of you about using the EB for big plants. Yikes! I actually think it didn't have to do with how top-heavy it was, but rather a gust of wind got it. With the foliage so dense, the wind had nowhere to go. Thankfully a deck chair broke it's fall so the damage was minimal. Yes; night time temps are too high. Where I live, day time highs have been 80-82 range but the night time lows are running around 75. Some fruit is still being set but later in the summer, the night time lows will hit the low 80s. The yearly night time lows have run 7-10 degrees warmer than average night time lows for several years now. The day time highs have not been higher than average. Your plants look great for this time of year. off the pool deck b/c no where to put the T-Posts. That's exactly what I was afraid of! By the way, my Earthboxes need water/are empty three times a day in the height of the season. When I let it go empty, the round tomatoes split with the next water, and the plums get BER. Last edited by Shrinkrap; May 28, 2018 at 12:01 AM. Super Sweet 100 can easily grow 8' tall and over 4' wide when not pruned. I have grown them that way in ground. I trim some leaves out to thin and allow air flow, keeps fungal diseases down a bit but also helps the plants not become sails in the wind. We put a firring strip on both sides of our Earthboxes between the cage and the box edge, hammered into the ground about 8 inches. DH cuts an arrow edge on them to go into the ground easier.I confess that we do this only after one falls.